Global Health is a multidisciplinary and diverse field in itself and requires one to view problems from multiple perspectives. Juxtaposition is determined to be a forum for multidisciplinary discussion on Global Health. To achieve this goal, we are hosting one of the most exciting Global Health panels of the year with Dignitas Youth. By inviting researchers and leaders in Global Health we aim to stimulate the much needed discussion on the topic of Neglected Tropical Diseases (NTDs). We hope that this event will explore the science, the challenges and the political economy of NTDs and will critically analyze the issues of access and innovation. 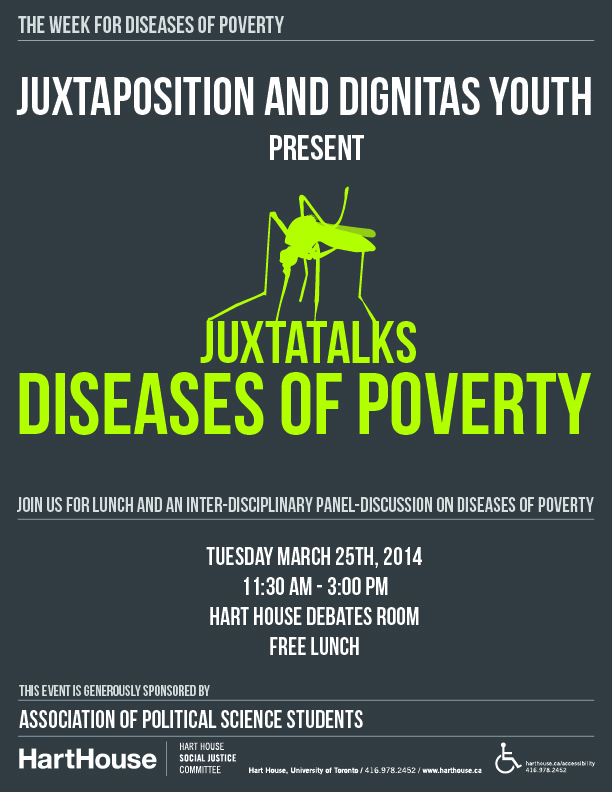 We are aiming to answer some important questions about the complexity of diseases of poverty. Why are poor people affected by these particular diseases? How does poverty cause these diseases? What are some solutions to this problem? Where should research resources be oriented? Sponsors: Hart House Social Justice Committee and Association of Political Science Students.